The Cedar Valley Nature Trail (CVNT) was built on the abandoned Waterloo, Cedar Falls and Northern railroad right-of-way in the early 1980s. The trail spans four counties and is more than 50-miles long. Thousands of people use it year-round for walking, running, bicycling, snowshoeing, and snowmobiling (on designated unpaved portions). The trail crosses the Cedar River east of La Porte City and near McFarlane Park in southeast Black Hawk County. 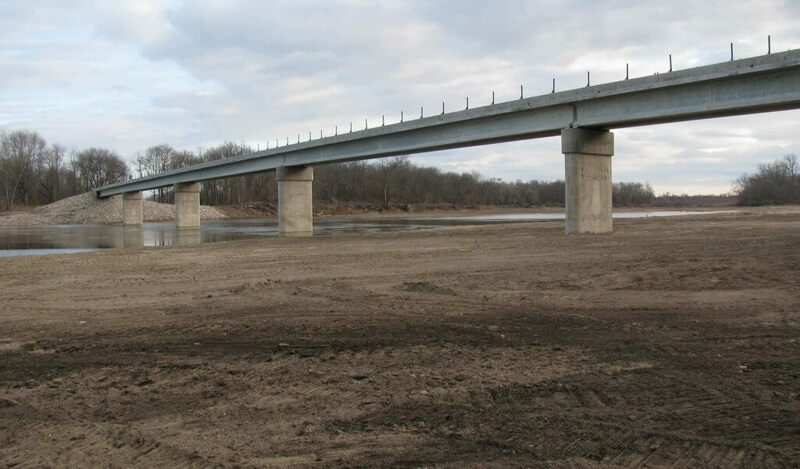 Historic flooding in 2008 damaged the more than 100-year-old concrete arch bridge spanning the Cedar River near the Park beyond repair and severed a connection between the northern and southern portions of the trail. Additionally, the design team modeled the Cedar River and the new bridge to ensure all permit and design requirements were met. The new bridge conveys significantly more water beneath it than the old structure. Over a half mile of paved trail was reconstructed adjacent to the new bridge to replace sections that were washed out during the flood. The project was let, and the low bid came in approximately 20 percent under budget. The existing bridge was removed, and the new bridge was constructed during the summer and fall of 2012. Snyder & Associates provided full-time construction observation services to ensure construction complied with the plans and specifications and that the documentation necessary for the funding was completed. The bridge officially opened to the public on May 4, 2013.